If you look at this user's questions, it's hard to see how his asking record could be anything but exceptional. According to SEDE his asking record is 0.875. The problem is that he asked many of his questions in the early days of the site that were well-received, but later deleted. Some were deleted after the question was migrated to another site. These users don't tend to ask the same question over and over again. I ran a similar test that excluded self-deleted questions. That group included a lot of cases of people asking a question, not getting an answer after a day or two, deleting the question, and asking the same question again. This strategy doesn't work if you wait two months to delete your first question. Two mods (George Stocker and Gordon), Tim Post, and myself are on the list of users who would get a Curious badge under this system. On Meta Stack Exchange 5 current employees would be newly eligible for the badge. In my (admittedly biased) opinion, these are curious users. I did some spot check on the lower end of the reputation scale. Every user I looked at fit my model of the ideal recipient of the Curious badge; they asked mostly upvoted questions with few closed questions. This change would add about 3286 new Curious badges on Stack Overflow, so there will certainly be a few exceptions I didn't find. But I think they are more than balanced by the clearly deserving users who will be awarded new badges. 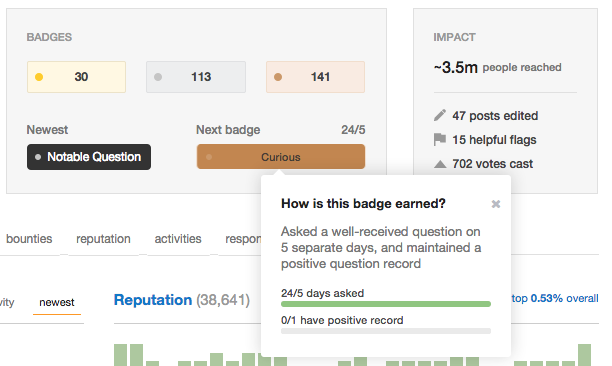 Proposal: For the Curious, Inquisitive, and Socratic badges, don't count questions deleted 60 or more days after asking as deleted for the purposes of calculating asking record. These questions may still count as negatively scored or closed, if applicable. Days that include deleted questions, no matter when they are deleted, do not count toward the days asked criteria. Modified Proposal: For the Curious, Inquisitive, and Socratic badges, don't count questions deleted or closed 60 or more days after asking as deleted or closed for the purposes of calculating asking record. These questions may still count as negatively scored, if applicable. Days that include deleted or closed questions, no matter when they are deleted or closed, do not count toward the days asked criteria. On Stack Overflow, that would add about 665 Curious badges, including two more for moderators (casperOne and 0x7fffffff) and one for an employee (Oded). On the opposite end of the reputation scale my spot checks are a bit muddier. Instead of a small number of deleted (and usually closed) questions, this list turns up users whose latest questions still aren't all that interesting. Even so, on balance a few extraneous bronze badges seem worthwhile in exchange for acknowledging truly curious users. Browse other questions tagged feature-request status-completed badges asking-days-badges . When does the question ban get applied?